Hi girls! Today I will be discussing a pretty popular trend going on in this day and age. Some/most of you have probably seen pictures on instagram, or heard of the fad in the magazines- Waist Training. Kim K started using the Ane Chery trainer not too long ago and now her and her sisters have been sporting them at the gym & while they’re out and about, snapping tiny-waisted pictures that have gone viral on insta. Some other celebs have fallen in love with the jaw dropping results as well.. Such as: Jessica Alba, Jwoww, Kylie Jenner, Lily James, Amber Rose, Snookie & Kim Zociak and more. Clearly these celebs have seen a difference after wearing the trainers, otherwise they wouldn’t bother forcing themselves into these itty bitty little things. And we have seen the differences for ourselves in those “too tiny to be true” photos all over the web! Guess who jumped on the bandwagon? That’s right, me! I’m gonna take you through a long journey consisting of what changes I noticed and how long it took to notice them, how I feel about waist training overall, the pros and cons, if it’s dangerous, what it baisically does to your body etc..! So ladies; if any of you have been or are curious to get to know more about training your waist, please do keep reading and feel free to ask any questions in my comments! 😘❤️ Also, I wanted to say that I personally think all shapes and sizes are beautiful. The reason I wanted to do this post is for people who have heard of this and may have been interested in it like I am so they can learn more about it. If you are uninterested in all of this please do not continue reading! So I decided to go ahead and order the “Official Kim K Sport Three Row Hook Trainer” $70.00 USD HERE. by Ane Chery off of Bombshell Bunny Curve’s website. She has been spotted wearing this exact same trainer in the color blue, so obviously that’s the way to go to make sure you get one that is super effective & not a cheap chinese knock off that wont last and wont be as durable. They also offer a Sport Two Row Hook Trainer, which is giving you one less row to cinch your waist baisically. I chose the three row so I could get how you say, more bang for my buck.💸 When it says Sport, it means the material is stretchy enough for you to wear to work, to the gym & even to bed. You can bend over and side to side with slight difficulty. Making this a great choice if you workout often or spend a lot of time on your feet at work/home. Now, above is a photo of me wearing my Purple Sport 3 Row Trainer on day #1. On their website, they have a size chart to help you determine the perfect size to buy for you. They say do not order a size smaller because they run small as is. I ordered the size small, and was unsure after I had ordered it. Once out of the bag I was even more doubtful, but it fits perfectly despite how tiny it looked. I have extra wide hip bones and large breasts so cinching my waist will be extremley noticable if I continue to do it. If you can get it on with difficulty, and still be able to breathe it is the right size for you. I’m not joking about getting in on with difficulty, it’s gonna be tough at first. You may need another person to help. But you should not be in physical pain at all. I can just shove one finger in between my trainer and rib cage, I think if you can’t do that or if you can fit two, it mat be way too small or big for you to work effectively and safely. If you order from bombshell bunny curves, they allow one size exchange incase you buy the wrong size. Other sites do not offer exchanges. Here is a sport trainer on the Left, and an Aggressive Latex on the Right. Sport comes in many colors/patterns (black, pink, purple, blue, cheetah etc.) While the latex comes only in black. How long do I need to wear my trainer each day to see results? 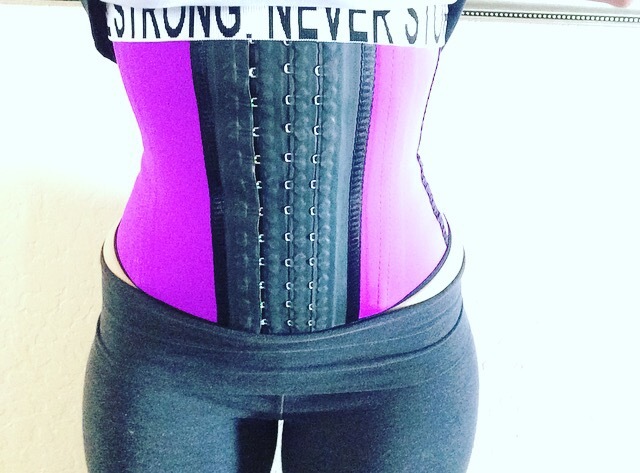 It is stated that you should be wearing your waist trainer 6-8 hours a day. Some women will wear them when they sleep as well to get it to ‘work faster’, but I would not do this personally. I wear it mon-fri from 7am-4pm which is 9 hours a day. Then on weekends I will wear it for 4 hours each day. Also i’ll put it on for any and all workout time because it strengthens your core and tightens your stomache muscles while your exercising, making the noticable results more long term. Will it harm my organs? No. 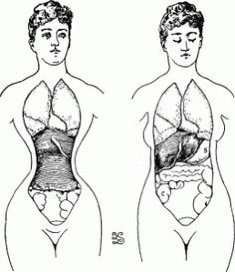 Waist training will not harm or damage your organs so long as you take it step by step and you don’t try to force yourself into a size that’s way too small for you… You can’t rush this otherwise you can hurt yourself. Also, being cautious while exercising is important. You do not want to hurt yourself or push yourself too hard while wearing a trainer. Your ribcage and insides are being trained to sit in a more feminine, appealing, & tighter knit fashion. Not much different from corsets back in the day. Depicted above is a trained waist on the left, and an untrained waist on the right. I’m impatient, How long untill I will start to see the results? Eveyone will notice a smaller waist once you physically put on your trainer at first. It gives you a cinched hourglass figure constantly while it’s on. Some will see results without their trainer off, within the first 2-4 weeks. Some in months. It depends on your body type and over health and condition when you first begin. It will take longer for really untrained tummies, and not so long for those who are already somewhat shapely and fit. Can I wear this under a dress to make me look thinner for example? Yes! The sport trainer I have is virtually undetectable beneath my clothes. I usually wear pretty form fitting items. 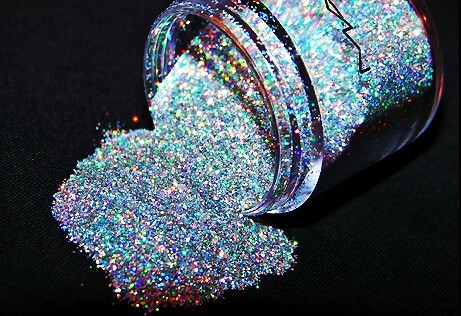 You should have no trouble wearing it under a dress, it will give you a lovely curvy shape. Putting on your trainer for the first time will seem like a difficult task. The sensation you should be feeling once it is all hooked up is: as if you were sucking in your stomache to the point of getting cramps. If you feel anything other than a cramping/tight held-in sensation, something is wrong and you could possibly harm yourself. There should be no light headedness, no rib, hip or back pain, no difficulty breathing, no bruises after removing it. Know the difference between discomfort and pain. Discomfort is totally normal, pain is not. After wearing it for the first 4 hours, your back/ribs may feel a bit restless or tense/cramped. Take deep breathes, feeling your ribcage expand, and arch your back while reaching up towards the sky into a nice strecth- this should help relieve that unusual feeling. Power through this because it is just the necessary adjustments/training your waist is adapting to. After the first week or so you will not experience as much discomfort after wearing it for long periods of time. Am I limited to only standing & exercising? Of course not! Many girls say they can drive, cook, clean house and shop till they drop while wearing their trainers. It all depends on your comfort level with said activity. Why can’t I sit down normally while wearing my trainer? I am in love and so enthused to continue this process. I have heard it helps back pain over time, which would really benefit me since I have 4 herniated discs in my lower back. 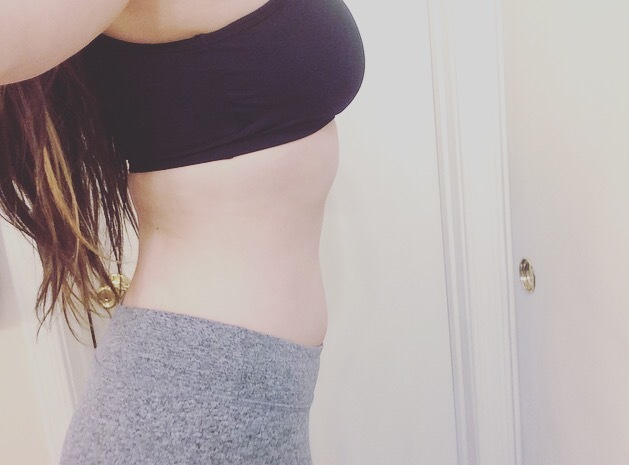 It feels wonderful when it’s on, I like the seriously tight sensation it makes my tummy feel nice and flat and I can already tell it’s working. I am going to check back in with you guys about this series, with before and after photos when I hit row 2!